Students at Four County Career Center in Archbold recently designed, fabricated and painted Santa’s sled for a Christmas display used as part of the Christmas Cruise Thru, to be held at the Defiance County Fairgrounds Nov. 17-Dec. 9. FCCC programs used in the sled’s production were: Specialized Mechatronics and Robotics Technologies, which used a CNC plasma machine to cut its shape; Welding Fabrication, which welded together parts; Auto Collision Repair, which completed base painting; and Visual Art and Design, which applied finishing touches. Shown with their holiday display piece is - from left - Ann Rodriguez of Archbold, Cain Shell of Evergreen, Jacob Fenter of Bryan, Abi Baker of Ayersville, Summer Collins of Ayersville, and Azelin Shaneyfelt of Liberty Center. Chris Zacharias, Welding Fabrication instructor, coordinated the project. Students at Four County Career Center in Archbold recently designed, fabricated and painted Santa’s sled for a Christmas display used as part of the Christmas Cruise Thru, to be held at the Defiance County Fairgrounds Nov. 17-Dec. 9. FCCC programs used in the sled’s production were: Specialized Mechatronics and Robotics Technologies, which used a CNC plasma machine to cut its shape; Welding Fabrication, which welded together parts; Auto Collision Repair, which completed base painting; and Visual Art and Design, which applied finishing touches. Shown with their holiday display piece is – from left – Ann Rodriguez of Archbold, Cain Shell of Evergreen, Jacob Fenter of Bryan, Abi Baker of Ayersville, Summer Collins of Ayersville, and Azelin Shaneyfelt of Liberty Center. Chris Zacharias, Welding Fabrication instructor, coordinated the project. 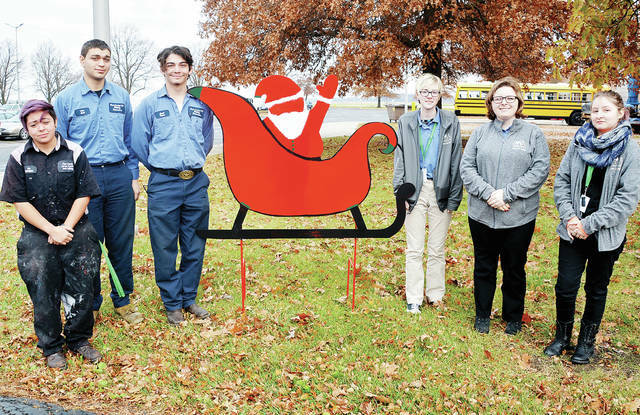 https://www.fcnews.org/wp-content/uploads/sites/45/2018/11/web1_2018-def-cty-christmas-display.jpgStudents at Four County Career Center in Archbold recently designed, fabricated and painted Santa’s sled for a Christmas display used as part of the Christmas Cruise Thru, to be held at the Defiance County Fairgrounds Nov. 17-Dec. 9. FCCC programs used in the sled’s production were: Specialized Mechatronics and Robotics Technologies, which used a CNC plasma machine to cut its shape; Welding Fabrication, which welded together parts; Auto Collision Repair, which completed base painting; and Visual Art and Design, which applied finishing touches. Shown with their holiday display piece is – from left – Ann Rodriguez of Archbold, Cain Shell of Evergreen, Jacob Fenter of Bryan, Abi Baker of Ayersville, Summer Collins of Ayersville, and Azelin Shaneyfelt of Liberty Center. Chris Zacharias, Welding Fabrication instructor, coordinated the project.